Oh, I use it all the time. I just love it; it’s nice and big. The curved knife with wooden handle is one of a woman’s basic tools. Women used them “very skillfully as a knife or scissors” according to 19th century Russian priest Ivan Veniaminov, and they were employed to cut meat and skins. Carl Merck noted in 1790 that, “There is a broad knife made of iron. They use it to eat with. They bite into whale blubber, for instance, and with the knife they cut off a good size piece in front of the mouth.” He also saw women using their knives to split seagull bones into slivers for making sewing needles. Vlass Shabolin: That’s a knife. 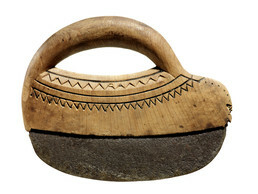 Mary Bourdukofsky: Did you use an ulu? Maria Turnpaugh: Oh, I used it all the time. Mary Bourdukofsky: Yes, me too. Maria Turnpaugh: I just love it, it’s nice and big. Daria Dirks: We don’t know if this one is ours then? Maria Turnpaugh: I’ve never seen this kind used. The Unangax^ woman’s igax^ [ulu, woman’s knife] is similar to curved or semi-lunar knives that are used even today all across the Arctic. Among its many uses in the Aleutian Islands were cutting hides to make clothing and boots. (1) Ivan Veniaminov wrote in the 1820s that the curved knife with wooden handle—a pekulka [knife] in Russian—was one of a woman’s basic tools, which she used “very skillfully as a knife or scissors.” It was also employed in cutting whale meat. Older knives had blades made of ground and polished stone, but iron had taken its place. (2) From his observations at Unalaska in 1790, Carl Heinrich Merck noted that, “There is a broad knife made of iron. They [women and men] use it to eat with. They bite into whale blubber, for instance, and with the knife they cut off a good size piece in front of the mouth.”(3) He also saw the women using their knives to split seagull bones into fine slivers for making needles.